For nearly a century Readers Union has been the leader in specialist book clubs. Because of the wide range of subjects catered for RU has built an immensely loyal customer base. Even their traditional following recognised the benefits of running the clubs through the web. So once RU's business plan dictated e-commerce as their future, it soon fell on PRIAM to supply the expertise. 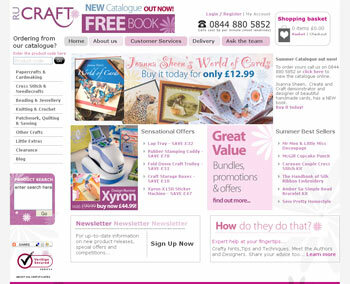 Just six weeks from order the first of many planned sites, www.rucraft.co.uk was live! This was only possible due to Readers Union using appease. This is the PRIAM e-commerce development tool that allows e-commerce sites to be built upon the full PRIAM ERP/CRM system. During this brief period Readers Union staff have been trained in the use of appease so the company has creative control over their own website. The next phase consisted of creating multiple e-commerce sites all linked to the PRIAM ERP back end. To which end both www.rubooks.co.uk and www.thehobbywarehouse.co.uk are also now live. As the system is multi-company each of the sites will run as unique entities. So not only will RU's customers benefit from a modern, convenient way of managing their accounts, the new site will cement their historical links through social activities such as 'blogging'. "To create an e-commerce website with all the functionality in such a short time is testament to the capabilities of appease." Glyn Carvill, Commercial Director at PRIAM Software.